OUR ArtProjects proudly presents our second solo project with Bree Jonson, a rising star in the contemporary Philippine art scene. 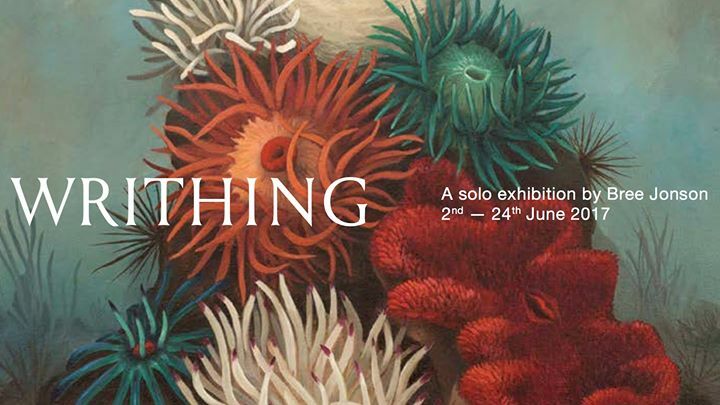 Made up of medium scale paintings and small sculptures, WRITHING examines the enigmatic qualities of creatures found on the seabed. Continuing her interests in the animal world, Jonson paints anemones and sea urchins, often misunderstood because of their striking appearances. The anemone is named after a flower because of its bloom like qualities and yet this beauty hides a darker, predatory existence. Its venomous tentacles emit toxins that paralyse its prey, normally fish and crustaceans, which are then guided into its mouth for digestion. However, the sea urchin is feared for its stinging spines and alien-like appearance. But these are nature’s defences against the many things that prey upon it like crabs, snails, marine mammals and worst of all: people. These dualities of beauty and ugliness, seduction and fear occur throughout the exhibition becoming not only a portrait of what lies beneath the sea but a mirror in which to view our humanity. With a particular interest in femininity, the subtle symbolisms embedded in WRITHING reveal the power dynamics of space and the body via Jonson’s uncanny observations of the natural world. OUR ArtProjects requests the pleasure of your company at the opening of WRITHING: A Solo Exhibition by Bree Jonson.